When a soluble Ag combines with its Ab in the presence of electrolytes (NaCl) at a suitable temperature & pH, the Ag-Ab complex forms an insoluble precipitate. When instead of sedimenting, the precipitate remains suspended as floccules, the reaction is called Flocculation. It can take place in liquid media or in gels such as agar, agarose or polyacrylamide. Precipitation and some other serological reactions are best seen when the antigen and antibody are mixed in optimal (equivalent) proportion. 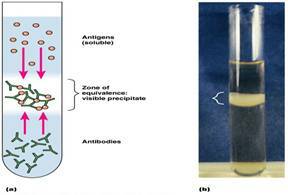 Serial dilutions of antibody when treated with antigen show that there is no precipitation where the antibody is in excess. This is called as PROZONE PHENOMENON and is caused due to failure to form lattice.